So there is a fire currently going on very close to our house. This morning (Saturday) upon our arrival to the Living Desert we got a call from Bryan’s brother telling us there was a fire in Corona. This information had me a little worried throughout the day. We got a few updates from other family members as we made our way through the Living Desert which seemed to calm my nerves a bit. On the drive home from Palm Desert on the 10 freeway I got my first glimpse of the smoke. It was quite large; it looked like a mushroom cloud. The fire started at the river bed where the 91 and 71 freeways meet. This is VERY close to our house. We live just off Green River. 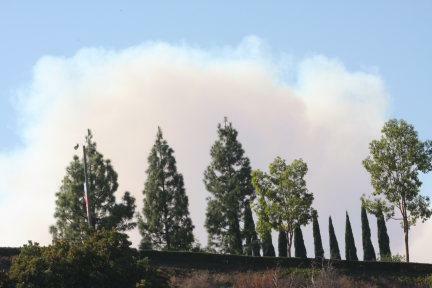 The fire has currently spread to Yorba Linda and Anaheim Hills, which means it is blowing away from us. Unfortunately though people have already lost their homes in this fire which is absolutely tragic. The fire line near us is currently burning up the plentiful fuel that is in Chino Hills State Park, one of Bryan’s favorite places to mountain bike. It looks like the firefighters are confident in this fire line as it is right next to the 71 and there are no homes in this area. So I assume it will continue to burn north into the park. We were supposed to hang out with our friends the rest of the night but we decided to head home to make sure our condo was okay. We drove up to the multi-million dollar homes above our house to get a better view of the fire. We stopped at the end of a cul-de-sac and walked along the side of a hill that dropped off just below these homes. What a view! I have never been to that spot that is so close to my house. I could see everything; the homes below us, the 91 and 71 freeways, the beautiful San Bernardino mountains and of course the fire line at Chino Hills park. I was awestruck, it was the most horribly amazing thing I’ve ever seen. The hills glowed with flames, the smoke blanketed the sun and there were dozens of water dropping aircraft flying in and out of the rugged terrain. As close as this fire is, it is amazing we haven’t been evacuated, but that could always change. I will keep you all posted. We have posted a few images from this fire from our vantage point in the gallery. Also you can view the fire map here. UPDATE 11/16 /2008 7:50am: Well the fire is definitely burning into Chino Hills State Park. Just look at that fire map. I believe they are now calling this fire the Triangle Complex Fire, at least that’s what I got from news reports. I don’t know if it was the firefighters plan to let it burn that much; there is a lot to burn in that park. Here is a picture that we took this past spring of Chino Hills State Park. It was abundant with wildflowers which means there is now a lot of dry brush out there. It has also been quite windy lately; not good firefighting weather. Hopefully our firefighters can get this under control soon. UPDATE 11/16/2008 9:30am: I decided to go out and see what our fire is looking like the morning after. As I walked outside this morning you couldn’t have guessed there was a fire blazing just north of us. The sky was perfectly blue and it was lightly breezy. A beautiful day by all accounts. I went up to the spot above my house that we went to last night, on the the side of the hill next to the ritzy homes. The smoke cloud was massive. My picture doesn’t even due this thing justice, it looks frightening. The hill that was on fire last night in the above post is completely charred. As far as I can see the hills are black and smoldering and they let the fire burn up to the 71 as I suspected. I feel so sorry for these people who have lost their homes, this fire was very erratic but it looks like we dodged a bullet as the fire is steadily moving towards Chino Hills and Diamond Bar. Hopefully those residents are prepared. After leaving the spot above my house I drove down Green River to the entrance of the 91 freeway. The wind was very strong as I stood out there and I realized there is still a long fight ahead for our firefighters. So far we have 5% containment. UPDATE 11/16/2008 11:00am: There is a fire adjacent to the our fire, the Triangle Complex Fire, that has been burning since yesterday as well. It is called the Brea Fire. As you can see on the fire map this fire is moving quickly towards Diamond Bar. My best friend Tara’s aunt actually lives there and is currently under a mandatory evacuation. I’ll post some of Tara’s photos if she takes any. 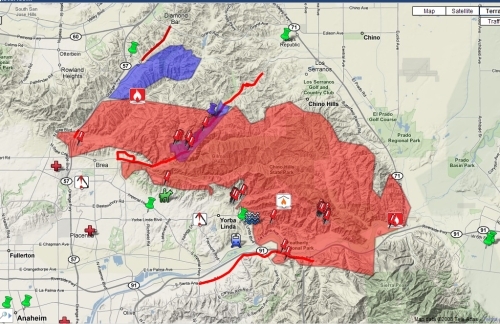 Judging from the fire map it appears that our fire and the Brea fire are dangerously close to merging, hopefully that doesn’t happen. Tara’s aunt didn’t have to evacuate after all but all the streets near her house were shut down. She still hasn’t dodged the bullet yet, the fire is still inching closer to her area but I’m confident the firefighters will stop it. The winds have died down significantly. Here is a picture Tara took of the smoke cloud near her aunt’s house. Yesterday when I was photographing at Green River and the 91 freeway entrance I took this picture below of a hill on our side of the freeway (south of the 91). As you can see in the picture half of the hill is obviously burnt up to a line of Phos-Chek. Bryan and I have been looking at the fire map constantly and at no point did we ever see that the fire had made it’s way to our side of the freeway. Upon our usual drive to work this morning on the 91 freeway not only did we notice the fire had burned up to the 91 on the north side, severely damaging the guard rail, but we also noticed that the hills south of the 91and east of the 241 toll had burned. Thankfully the firefighters got that fire in check quickly or else who knows what would have happened to the houses near us. I can say this, if the hills next to the toll road burned who knows how long it would have taken to put that fire out. We happen to live right up against the Cleveland National Forest and there is definitely a lot of fuel to burn. I took a few photos as Bryan drove along the 91, it was very sobering to see the burnt trees at the golf course, Featherly Park burnt beyond recognition and the median of the freeway blackened. I had to roll down the window to get a few shots and that was the first time I actually smelled the fire or more accurately what the fire left behind. We are hoping that when this fire is over Bryan and I will be able to ride down the bike path near our house, which takes you along Green River and Anaheim Hills, so we can see the devastation first hand. We also plan to go to Chino Hills State Park once it opens again and see what is left. Check back for those photos in a few weeks. UPDATE 11/17/2008 12:00pm: It appears the fire map has finally been updated to reflect what we saw this morning, i.e. the hills on our side of the freeway had burned. As you can see on the map the fire has covered a substantial area. Worst of all the Brea fire and the Freeway Complex fire have merged. I assume that’s why they renamed it the Triangle Complex Fire. The thing that frustrates me about this map is that it doesn’t distinguish what is currently burning from what has already burned. It’s all just one big red spot. I fear that one of the spots that has already burned next to my house could flare up again and I wouldn’t be able to figure it out. It’s hard to sit here at work and not know what is happening in your area. I will hope for the best.